The heart starving nature of the absence of “me too” in human conversation – a daily normality for those of us in the early years of grieving childlessness and/or recovery from multiple failed fertility treatments. Julia Leigh’s Avalanche: A Love Story spelled this in me for a bit. Her compact, almost torpedo like manner of iterating the realities surrounding wanting a child, attitudes towards conception, the fertility industry, failed treatments and their emotional fallout, is riveting. It is my hope that the above will one day be understood as normal responses to abnormal circumstances. In the meantime, I’ll take it as confirmation that I wasn’t crazy and that furthermore, like motherhood, this experience is also universal. I’ve always said, me and people like me have been dealt a double whammy – we lost our children AND due to the way we lost them we are then thrust into the excruciating position of having to explain our life altering pain and plight. Ms. Leigh doesn’t do this, however. Her lack of justifications for her raw pain, actions and other feelings held me in a captivated grip throughout. In her writing is a blatant absence of coddling those fortunate enough to have sidestepped this gruesome path of infertility, reproductive medicine and involuntary childlessness. Her unabashed accounts dare those with softer hearts and open minds to empathize while perhaps provoking those emotionally checked out souls with superiority complexes to do what they do best – judge and condescend. Rachel Cusk’s New York Times review of Leigh’s book was every bit as inappropriate as Avalanche is bold. Steeped perhaps in the privilege of having no concept, Ms. Cusk drags us through incorrect assumptions and baseless analogies, such as likening balancing career with easily procured motherhood to negotiating a career amid the thrashing roller coaster of fertility treatments. Her cluelessness felt both insulting and comedic. Her review went way past a healthy critique of the work into a depth of disregard that, in my opinion, warrants an apology. I found myself wondering “Is there any other major human struggle towards which such indifference would be tolerated – as a feature in the New York Times Book Review, nonetheless?” Sadly, I venture to say the answer may be no. For all her haughty spewing on the job of a writer she epically misses what I feel is a major responsibility of those who write – perception of the universal. Ms. Cusk’s failure to see a piece of herself – and her children – in Julia Leigh ironically illustrates the need for such a book as well as more books on the subject. You can find my comment on the review, as well as some others on the Times FB page here. Took me awhile to get there. As I finished the book, dangling, a smirk spread across my face. Two years and eight months out of my final failed treatment, I know there’s more to this powerfully told story. So much more. Who will tell the rest and how will they do it? A story void of the stroke of luck of a child being born is such a worthy one to tell as, like motherhood, the experiences of grief and resurrection are also universal. 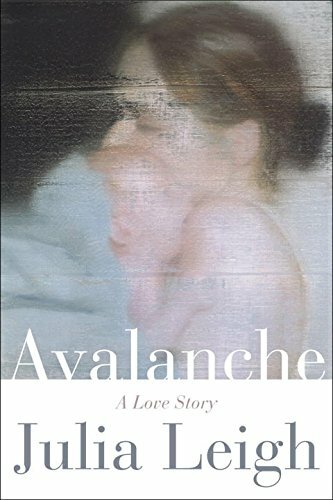 Julia Leigh’s Avalanche, A Love Story can be ordered here. This post is a part of a blog tour organized by Pamela over at Silent Sorority. Visit her blog for her post as well as links to many other reviews of this wonderful and much needed book. p.s. Why does NY have to be so damned far away from California? I want to put a couple of glasses on the table, pull out a cork on a nice full-bodied red and riff further with you. I have a hunch Julia would be there in a heartbeat, too. Our twinned responses – one more shred of proof our experience is universal. When people in the outside world respond to me as though my plight is just a me thing, I become indignant. I don’t see how they don’t realize that if they went through something comparable, they’d respond and react in similar ways. I love this review! You always manage to say exactly what I wish I could say. And thanks for the compliment. Although my review would have been much improved had I included a Kinseyism or two. Damn…..next time. It just dawned on me why Cusk may have attacked the way she did: Julia Leigh didn’t justify her pain. She just presented it in It’s most raw state. It added fuel to her belief (and society’s) that those going through treatment who don’t end up bringing home a baby after it should be justifying. And I’m absolutely horrified and even more angry at this presumption as we do not expect this from others going through similar types of trauma (cancer, heart disease, etc). Regardless of Cusk, I agree with you about the power of Julia’s memoir. It’s valuable, even to those who claim otherwise. Thank you for putting together these quotes in such a beautiful way. For sharing insights to your own story with this review. I’m in a phase where I’m trying not to waste too much of myself explaining and justifying where I’ve been and where I’m at. It’s hard, at least for me, so that’s why I respected what Leigh did on that account. Unfortunately, a socially unacknowledged loss + a lack of empathy = many “opportunities” to explain oneself. But I’m trying to cut back. For me it’s a question of energy use – and principle. While it might fall more heavily on some of us than others, I think most, if not all of us, in the IF community are unfairly expected to justify our pain and the life altering impact our experiences have had on us whether we bring home a baby or not. I agree with you, definitely not ok!!! I agree…Cusk was out of line. Cusk seems to feel that people should know their ultimate place in life and so they shouldn’t aim for long-shots. When I read Cusk’s review, I could almost hear her shouting between the lines, “Look infertiles, if at first you don’t succeed, by all means try try again, and after that quit so you don’t make a damned fool of yourself.” In Cusk’s view, the biggest disgrace and tragedy seems to be trying for longshots in life only to come up empty-handed. Much better, in her view it seems, to save face and quit early. And if you fail to heed her advice and then end up with wasted time, money, energy, and hope, then you have only yoursel to blame because you foolishly tried to beat the odds when you clearly should have grimly accepted that you never had what it takes. Therefore, others should be spared from allowing you your grief ( and heaven forbid supporting you in it) because you brought your loss on yourself. Cusk couches this message in obtuse writing and silly analogies, so the harshness of it doesn’t quite come through, but there it is, fleshed out in all its uncharitable ugliness. Kudos to all the courageous writers out there who did whatever they could –out of real love– for their dreams. Absolutely! Thanks for your comment. Cusk totally missed (among a boatload of other things) that, depending upon one’s medical case, it often doesn’t look hopeless – heck, it often looks entirely probable. Unlike Leigh, I had two day embryo transfers, but what she experienced with her blastocysts I experienced with a high number of embryos (24, almost all great quality, from 4 fresh cycles at age 41). People for some reason have a hard time realizing what little control we have in all of this, and what unchartered territory it is. I kept expecting to feel like I had done enough at some point, “excited” to move on to adoption, reconciled even, but I never totally did. We just had to stop because we were broke, I was half dead, and I felt I should not put any more of those ambiguous drugs in my body. I always say, if you seek treatment for a spinal chord injury, if it’s presented to you that chances are decent you’ll regain some mobility in your limbs, is your grief/frustration when it doesn’t work your fault? Is it your fault for having tried in the first place? I don’t think people realize how fundamentally basic the need and desire for children is, unfortunately, until they have it taken away. Yes, yes, yes! The more we speak and ban together (easier said than done, of course), the less our experiences will be seen as personal flaws and the more they will be seen as they are – normal responses to abnormal circumstances. I agree wholeheartedly when you say that “her review went way past a healthy critique of the work into a depth of disregard that, in my opinion, warrants an apology”. It got personal. I’m sure it reflected exactly what she would say if you gave her a glass of wine and raised the topic of women who do IVF. Same as those women in the UK (and I know a few; I’m related to some of them) who start spitting about “taxpayers’ money!” and “just adopt” when you bring up the subject. I love your question “Is there any other major human struggle towards which such indifference would be tolerated…?”. I’ve mentioned before my fascination with this: why is there universal free rein to pile contempt and disdain on people who have infertility treatments instead of just putting up and shutting up or saving the orphans? Is it just a massive failure of empathy, or something more? Obesity, smoking-related illnesses: the opprobrium might be out there but you definitely see it less than the vilification thrown on people who struggle with IVF. I share your fascination. I’d guess the “answers”, if there even are any, would be varied and complex? I wonder how this could even be studied and examined? But it definitely exists. One thought I have is that having children has, likely since the beginning of human history, been so (mistakenly) connected to human worth and value and higher powers that people subconsciously feel, if god or the universe, or however that person views it, is not “granting” someone a child, then they are somehow worth less. I also think that for people to really empathize with us they have to face how random things may be and how little control we humans have over such a crucial thing. And, there’s the (also mistaken) one sided world view that having children is what’s good for the planet, so if you couldn’t “contribute” to the greater good with your own children then it’s automatically your job to “contribute” to children that are already here. Very shortsighted! I’m really looking forward to reading this book. Thank you for the recommendation and review. You’re welcome, Elizabeth. If you end up reading it, I’d be interested to hear what you think of it. Awesome review. I love the sections you highlighted. Thank you. I noticed some of the sections I highlighted seemed to resonate with many others, too.